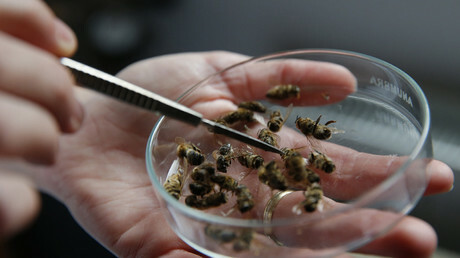 South Carolina honey bees have begun to die in massive numbers. Death of the areas bees has come suddenly to Dorchester County, S.C. Stressed insects tried to flee their nests, only to surrender in little clumps at the hive entrances. Dead worker bees littering the farms suggested that 'colony collapse disorder' was not the culprit. In colony collapse disorder, workers vanish as though raptured, leaving a living queen and young bees behind. Instead, the dead heaps in S.C signal a more devastating killer. The pattern matches acute pesticide poisoning. 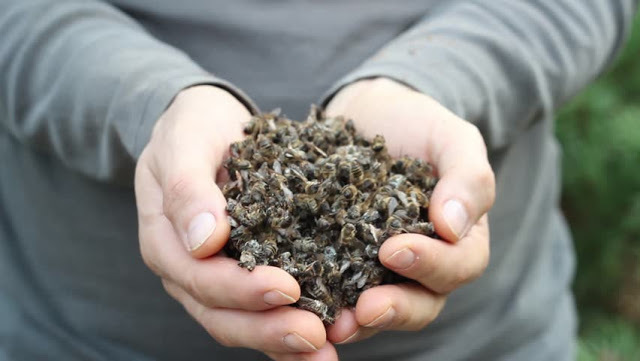 By one estimate, at a single Bee Farm in Summerville, 46 hives died on the spot, totaling around 2.5 million bees. A Clemson University scientist collected soil samples from Flowertown on Tuesday, according to WCBD-TV. The bee farmers have a clear opinion. Their bees had been poisoned by Dorchester's own insecticide efforts, casualties in the war on disease-carrying mosquitoes. Trucks trailing pesticide clouds are not an unusual sight in S.C. This is thanks to a mosquito-control program that includes destroying the insects larvae. Given the current concerns of Zika virus, Dorchester decided to try something different. It marked a departure from Dorchester County's usual ground-based efforts. For the first time, an airplane dispensed the pesticide in a fine mist between 6:30 a.m. and 8:30 a.m. on Sunday. “Had I known, I would have been camping on the steps doing whatever I had to do screaming, ‘No you can't do this,'” beekeeper Juanita Stanley said in an interview with Charleston's WCSC-TV. Stanley told the Charleston Post and Courier that the bees are her income, but she is more devastated by the loss of the bees than her honey. Summerville resident Andrew Macke noted that the hot weather had left the bees particularly exposed. Once temperatures exceed 90 degrees, bees may exit the nest to cool down in what is called a beard, clustering on the outside of the hive in a ball. Neither Macke nor Stanley had covered their hives.